DR14, Dreadnought Steel String Guitar from Tacoma Guitars. Guitar made in USA, originally Tacoma is a trademark Corenne but she t bought by Fender in 1996. The Mahogany on the back and clises produces sounds Gnant for registration, (unless it is of the varnish utlis?). For the record, we must take prcautions in utilsant cotton clothes to limit these nuisances for example. The sound is very good vritablement: rich and balanced. Very good projection. The sound is velvety soft, shiny and ... No not at all mtalique ... We feel that the wood life, this guitar a me! 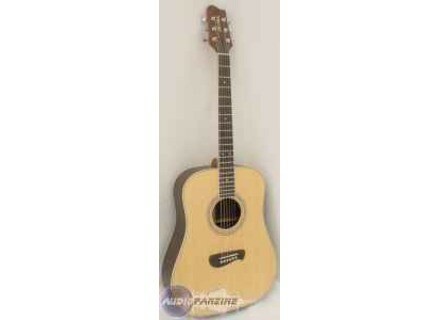 I tried many guitars before buying, including Lakewood 2500 euros. Well the sound of the Tacoma was softer, more subtle and intelligible! Really, forgive my language but i was on the c l. The ropes used were the same for the two guitars. I recently and I love this guitar dj. This brand is little known in France but has very good echos the USA. I recently and sound let me down. I think that with the age, it should surprise me even benefit ... The finish is sober and correct. For my part, I bought 1000 euros, list price is 1500 euros so for the very good quality blow money. The box is large (size D), but it is trslgre and knows how to forget. The first agreement, one is struck by the accuracy and balance of his harmonic palette. Come up with a set of string of good quality, is simply bluffing. It reminds me of the D28: the lower are accurate to the medium rather tonic and crystalline highs. It is a happiness to register with it elsewhere (this, I do not understand the opinion !!!). Previous Buddy-ing his love: do not mix taking APRS While Taylor himself mne my life miserable! What is impressive is the reserve of gain, chest it, the action is low but she never frieze. My style of music is "folk-jazz." I did absolutely nothing wrong about it: the violin is unadorned, the finishes are very good. We just love the rose transparent cache.